Friday's with Eddie - week 5. This time of year can really get a bit crazy can't it? The shopping centre car parks are are already full by 9am in the morning, any day of the week. And we've all seen that manic look in the eyes of parents or grandparents carrying long shopping lists and trying to hide presents from the kids who are glued to their legs. The hysteria gets more and more intense as Christmas approaches. Seriously, haven't people heard of online shopping? Seemingly not. Getting caught up in all of that craziness is not my idea of fun. Instead, why not hit the beach?! Our latest adventure in my Friday's with Eddie series involved putting on some sunscreen, collecting a few beach toys and driving to the beach. Is there no happier place to be for a child or a dog, than the beach? I think not. Running, splashing, collecting shells, chasing balls, digging holes, burying treasure - there is no better place for kids and dogs to embrace their wild side and RUN. We made sand castles in the wet sand, we watched dogs chasing balls thrown in the water, we strolled along the beach finding pretty shells as the sunshine warmed up the morning. We were here and we mattered. The people you meet smile and say "hello"or "good morning"
Healthy and fit and on the beach to ensure your safety. The shopping centre alternative is too unbearable to think about... actually, is there even an alternative? Most of the security guards I've seen are sweating in ill-fitting suits and square-toed shoes. Having a life guard on duty wins. Every. Single. Time. You've probably already noticed that I'm a HUGE advocate for making memories with people you love, and giving them the gift of your time rather than spending money on things that they probably don't want or need. Heading to the beach with your child and exploring the shoreline and rock pools, will be a far more positive learning experience than any shopping trip. Playing games at the water's edge, chasing each other and discovering new shells or sea creatures will become beautiful memories for your family. What else would you add to this list? 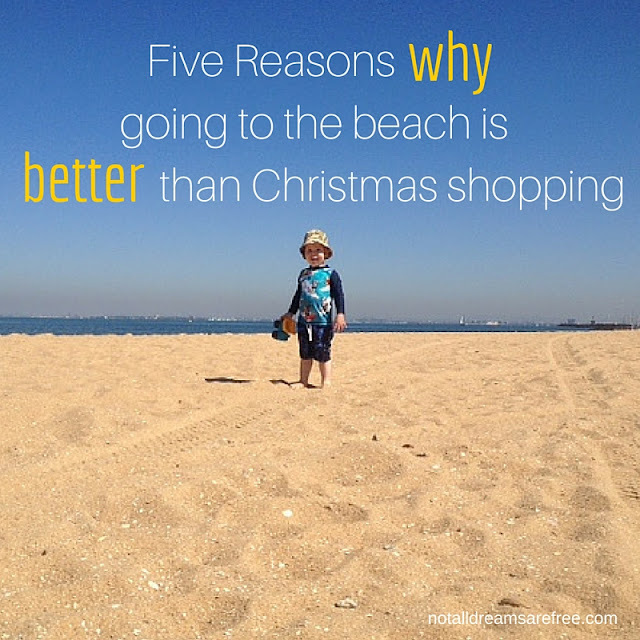 Or would you argue that shopping is more fun than the beach? I'd love to hear your thoughts or suggestions!